Share your BHOF love; also meet the bad girls of The Detroit Cobras. 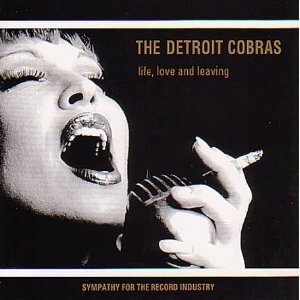 While we wait for those feathers to be preened and arranged, I thought I’d give a little attention to the undomesticated ladies who front the rollicking retro-garage combo The Detroit Cobras. Any burlesque fan worth their salt understands that music plays a huge role in the energy and feel of a burlesque number. The Detroit Cobras have energy in spades, and I’d love to see a number featuring one of their fiery tunes. Frontwoman Rachel Nagy (a former exotic dancer who looks a bit like a blonde Tura Satana) screams and shouts her way through innuendo-laden fifties and sixties covers and throwdowns such as “Leave My Kitten Alone” and “Shout Bama Lama”. I’m surprised I haven’t heard of a burlesque routine to Cobras original “Hot Dog (Watch Me Eat)”. One can only hope. For more on the Cobras, read my random preview HERE and check them out at Neumos in Seattle Tuesday, June 7 by clicking HERE. ~ by angrytruffle on 06/06/2011.